BatteryBar Pro Sale: 50% off! Use it more, and it gets better. BatteryBar calculates your remaining battery power based on past performance. BatteryBar Pro has a power scheme switcher, graphs, warnings, and custom themes. Buy it now. BatteryBar Pro: Perfect for you. Adjust the battery meter's look and feel with comprehensive display preferences and custom themes. Trigger alerts alerts with warning levels, and let power-saving features keep your system running. All this makes for a great value. 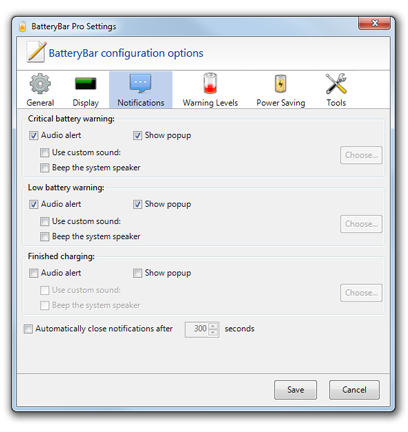 BatteryBar Pro costs only $8 for a lifetime license. This application will only get better with time, so start enjoying its ease of use today. Download the free basic version to try it out. For only $8, you get one lifetime license for the feature-packed BatteryBar Pro. All updates come at no additional cost. 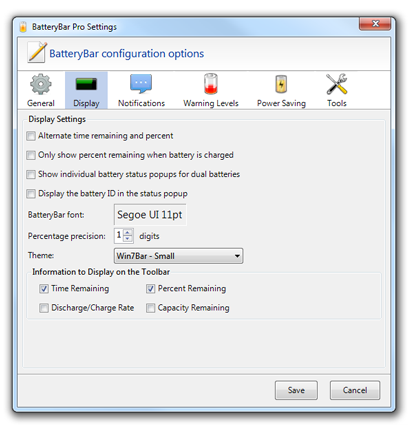 Get the free version of BatteryBar. This version lacks many features of BatteryBar Pro, but it's still accurate and useful. Discounts are available for purchases of three or more licenses. Please email chris@osirisdevelopment.com for more information. We welcome bulk purchases.